JOLIET, Ill. – Speculation continues to mount that NASCAR will add Jeff Gordon to the field of drivers in this year’s Chase for the Sprint Cup championship. As practice got underway shortly at noon for Sunday’s Geico 400, there were numerous reports circulating that NASCAR officials were huddling here at Chicagoland Speedway to determine if any further penalties will be doled out as the fallout from Saturday night’s race in Richmond, Va. continues. On Monday night, NASCAR removed Martin Truex Jr. from the 12-driver Chase field and replaced him with Ryan Newman. 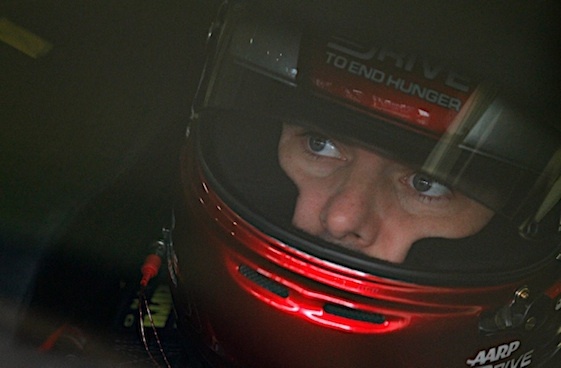 Michael Waltrip Racing was subsequently hammered with record-setting penalties. But the drama lingering over Saturday night’s regular season finale didn’t end there. Audio between driver David Gilliland and his spotter surfaced later in the week when the two plotted to slow in the closing laps and allow Joey Logano to pass and pick up a valuable point. That single point was enough to put Logano into the Chase. NASCAR met with representatives from Gilliland and Logano’s teams on Friday morning as the investigation continued. As Sprint Cup practice continued just before 1 p.m. local time, members of the press in a jam-packed media center continued to wait and see if another domino will fall in what has turned into what is arguably the greatest controversy in the history of NASCAR. Brian France: Just waiting for the money transfer to clear the bank and then we will announce Jeff Gordon is also added to the chase. Mike Helton: Brian the money just hit the account. Brian France: Thanks Mike now lets do that press conference announcing Jeff Gordon has been added to the chase and don’t forget to thank our buddy Rick Hendrick for the donation!